"Magic Carpet Ride" is a rock song written by John Kay and Rushton Moreve from the Canadian-American hard rock band Steppenwolf. The song was initially released in 1968 on the album The Second. It was the lead single from that album, peaking at number three in the US, and staying in the charts for 16 weeks, longer than any other Steppenwolf song. In 1988, the band rerecorded the song with the hip hop group Grandmaster Flash and the Furious Five. The track appeared on their reunion album On the Strength. A 1978 version by the South African group Buffalo spent 12 weeks on the Springbok Radio charts, peaking at number five. Billy Paul on his 1971 album Going East covered the song. ^ Gary Littman (1 October 2012). In Love. AuthorHouse. p. 3. ISBN 978-1-4772-7660-0. Retrieved 27 September 2015. 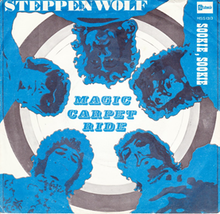 ^ "Magic Carpet Ride - Steppenwolf - Song Info". AllMusic. ^ Steppenwolf - Chart history, Billboard.com. Retrieved January 25, 2014. ^ "Item Display - RPM - Library and Archives Canada". Collectionscanada.gc.ca. Retrieved 2017-07-14. "The Adventures of Grandmaster Flash on the Wheels of Steel"